Business cards are necessary for every business and can do much more than provide people with your contact information. Be sure to include, your logo, slogan and web site address and don’t forget there are two sides to the card. Extend their usefulness by including a special offer or discount, reward system or coupon. double-sided, 4-colour cards - 250 - $39, 500 - $49, 1,000 - $79. 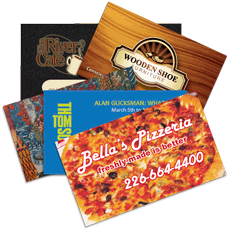 Business cards are printed on heavyweight stock in a variety of finishes, single or double-sided. Cards can be designed with horizontal or vertical format. Special formats such as appointment cards are available with a gloss/matte finish on the face and a writeable back. Rounded corners, embossed and spot lamination make for outstanding looks. Cards are printed on 12, 14, 16 and 38pt stock.